Must be 21 or older and provide official government identification. Please note that this experience will last 30 minutes. Guests who arrive intoxicated will not be allowed to participate and will not receive a refund. Welcome to Beer Tasting Experience, our in-house beer extravaganza that encourages guests to try diverse beers. A cicerone - commonly known as a beer expert - will dive into the culture of eight different beers, explaining the subtleties and varieties, as you sip the beers. Also, they will even offer tips and tricks for pouring, making the experience both hands-on and educational! 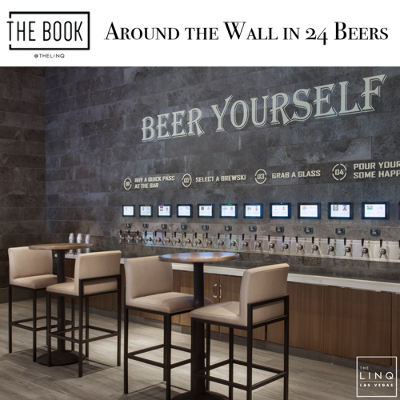 The beer wall is a super over-the-top display so awesome that you'll be taking all sorts of pictures for posting! Vegas is all about play and we're capturing the essence of it in this experience. Feel free to break away from their standard choices and day-to-day palette pleasers while opening up to a whole new world of tastes.